The seed catalogs start piling up in January. If it’s a gardener from New England, the task is easy. 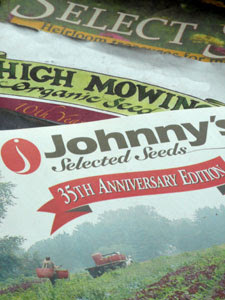 We tend to recommend regional companies such as Johnny’s Selected Seeds (in Maine) or Select Seeds (in Connecticut). These regional seed providers select varieties that are well-suited to our unique growing conditions. For other regions of the country, we don’t have the advantage of personal experience, so we’re asking for your advice! Please leave a comment below and let us know which seed companies you turn to—especially for region-specific crops such as tomatoes and peppers. We’ll compile a list of regional sources, and with that in hand, will feel confident about making good recommendations to anyone who asks. Tomato Growers Company here in Fort Myers, FL has been an excellent resource for this Michigan transplant. They also have a horticulturist on staff that has great advice on what works here & what doesn’t. There are several in the PNW that come to mind. My favorite (and closest to me) is Territorial Seed Co. in Cottage Grove, OR. There’s also Nichols Garden Nursery in Albany, OR, Victory Seed in Molalla, OR. The Seed Saver’s Exchange (seedsavers.org) is a good source for heirloom varieties. Bakers Creek Heirloom Seeds (http://rareseeds.com)in Manfield, MO has heirloom seeds of all varieties that they collect from all over the world. They also sell to a lot of the other seed houses so why not go to the source? Johnnys caters more to commercial growers. For smaller buyers like myself, I suggest Pinetree Seeds and Fedco (a coop), both also in Maine. Fedco also sells plants, seed potatos & organic fertilizers. I like Bakers Creek Heirloom Seeds, ordered last year from them, great choices on hard to find seeds. I just ordered from Seed Savers Exchange, good prices and amount of seed for your money. My few favorites for the California East Bay Valley are: Renee’s Garden of Felton, CA -Seeds of Change, Santa Fe NM – and Botanical Interests, Broomfieldm CO. I have used seeds from Gurney’s and Henry Field’s for 43 years and have always had excellent results. My two gardens cover about 1 acre of ground so the seeds that sprout and grow well, as well as the cost of the seeds, are very important to me. I will continue to buy all my seeds from these two companies. I live in Idaho and have always used seeds from Henry Field’s and Gurney’s. The seeds from these two companies always germinate and produce high yields that have the best flavors of any produce I have ever tasted. I take lots of produce to the local Farmers’ Markets and it is always gone by noon. At my recommendation, about two yrs. ago several of the other vendors purchased their seeds from Henry Field’s and Gurney’s. They have since told me they have seen a major increase in production as well as flavor. Needless to say, they have also seen a major increase in their income from the produce. Two great Maine seed companies are FEDCO Seeds (http://www.fedcoseeds.com) and Pine Tree Garden Seeds ((http://www.superseeds.com). I especially like the smaller size seed packets available from Pine Tree, and both places have a great variety.